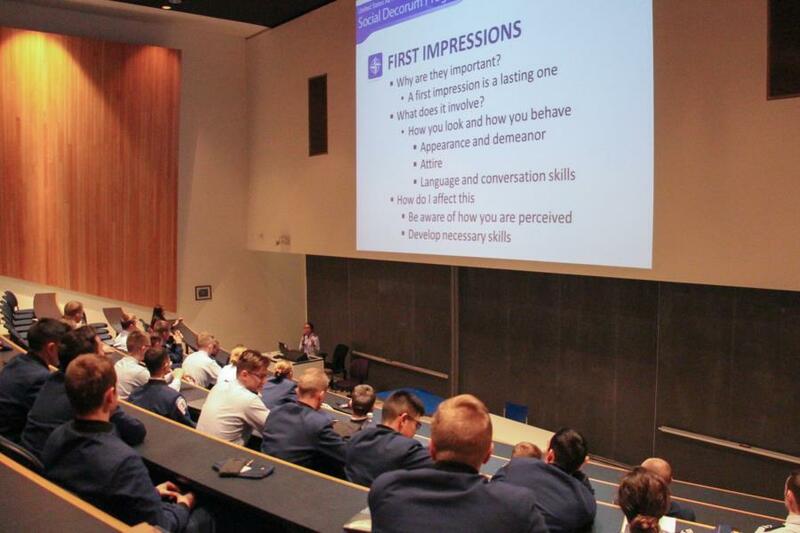 Several years ago USAFA created a requirement for an etiquette training program that would instruct cadets in "military protocol for social and business situations" as well as giving them the expertise they need to be successful in the U.S. Air Force as well as in life in general. 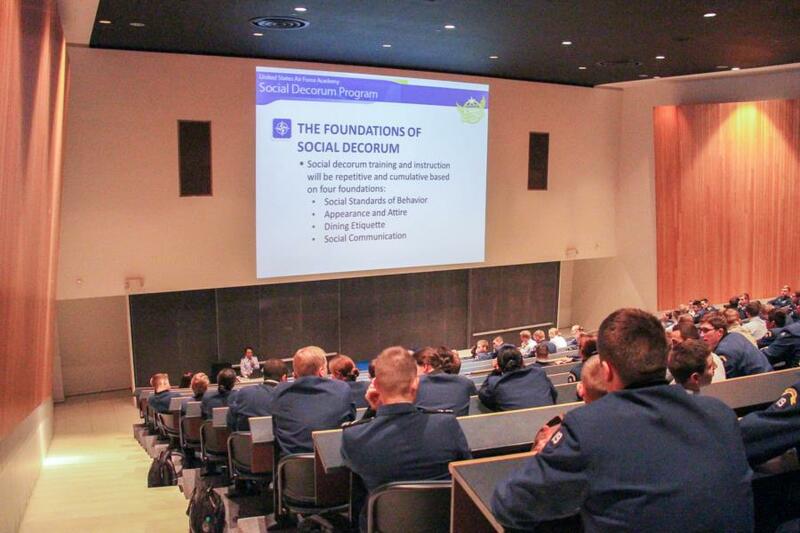 Each Class year has their own Social Decorum Training and the topics will vary. 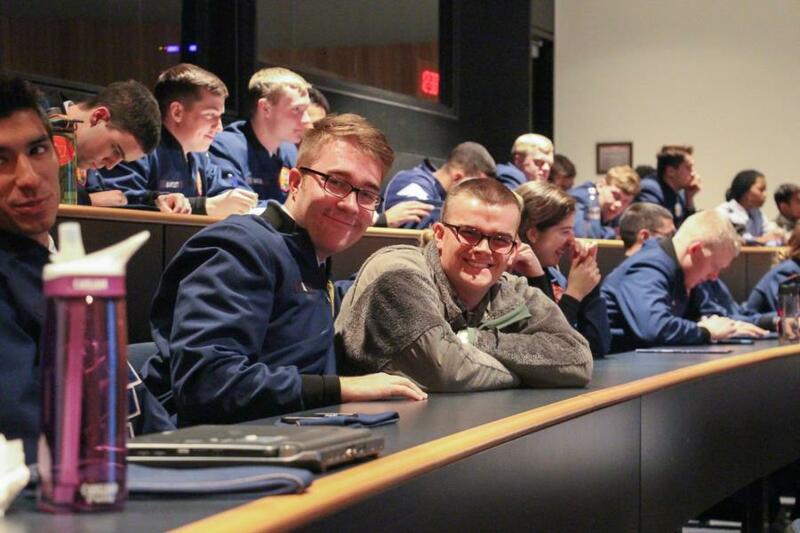 "The objective of the social decorum program is to provide cadets with the knowledge and resources to ensure appropriate social behavior while being approachable in and out of uniform. The program will provide instruction both in the classroom, as well as in actual social events to provide as much realism as possible. Social decorum training is imperative to ensure our future officers have confidence and are comfortable in all social situations." 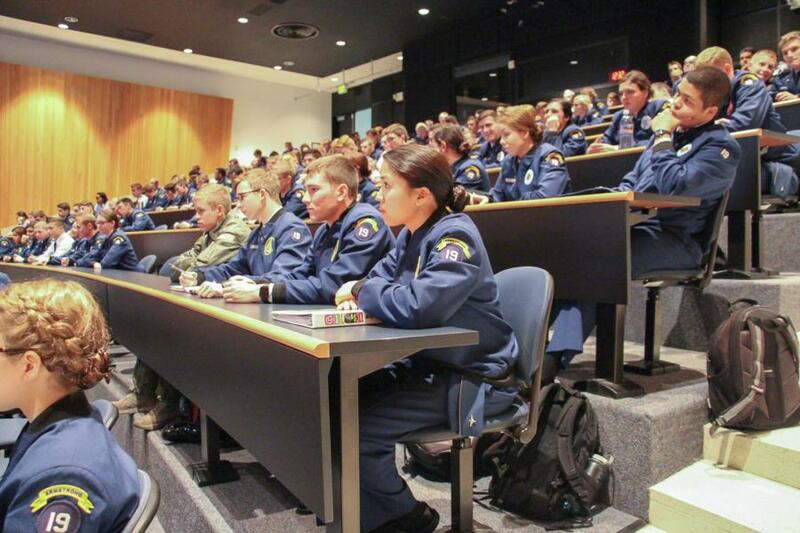 and "instructing cadets, on the correct protocol for social and business situations. The training should include military, dining, and social decorum. Topics of instruction include: Personal/social correspondence (invitations, RSVPs, thank you notes, etc. 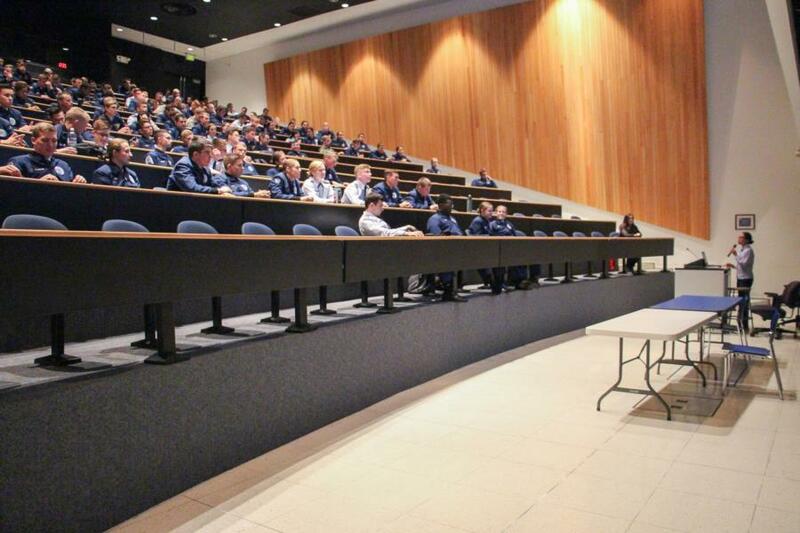 ), receiving lines, appropriate civilian attire, basic manners, common courtesies, telephone etiquette, table etiquette, and proper etiquette for typical USAFA functions (ring dance, sponsor visits, graduation and commissioning ceremonies, dining-ins, dining-outs and events at senior leaders’ quarters)." 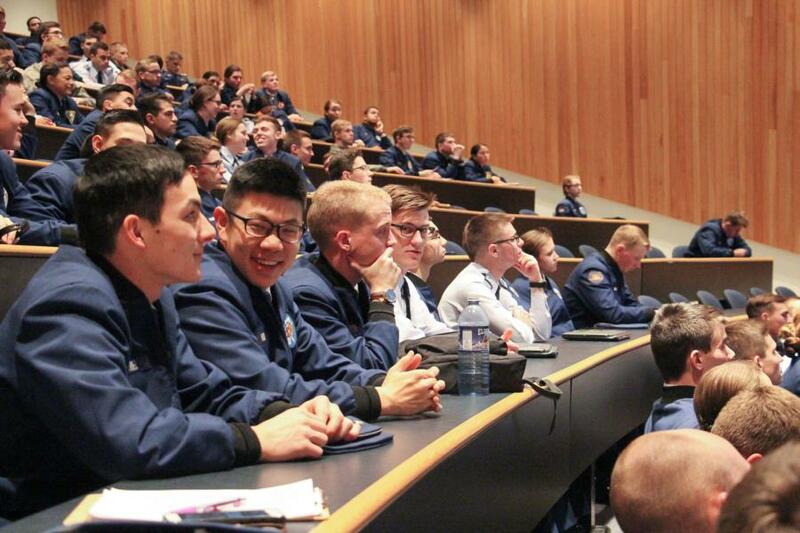 For the lower two classes the Fairchild Lecture halls is where 5 Squadrons will meet at a time with other classmates from their class year. With the upper two classes it is slightly different, rather than attending these classes up on the hill they have theirs at the Falcon Club where it is much more formal in attire and atmosphere. Here they attend them as a squadron rather than class year and only 2 Squadrons will go at a time. Our coverage of Social Decorum Training today happened to be with the Cadets from the Class of 2019. To view the rest of the pictures from our glimpse into 2019's Social Decorum Training, go to Classes - 2019 - Character & Leadership Development. Or click the link below.